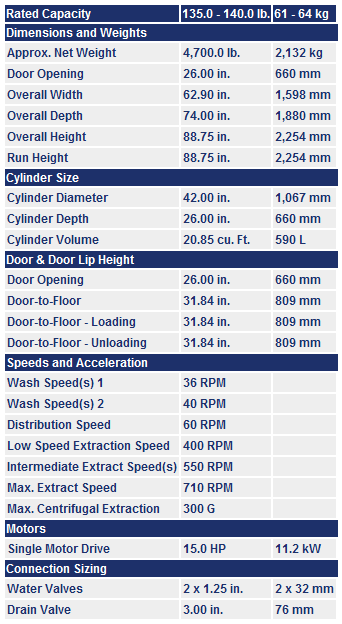 Larger cylinder volume than most competitive similar-sized washer-extractors provides greater productivity. More linen washed per day or fewer hours required to process. Greater cylinder perforated area generates better wash quality, better rinsing and better extraction. Less damage improves user's image. Reduces linen costs. High perforated ribs provide excellent lifting. 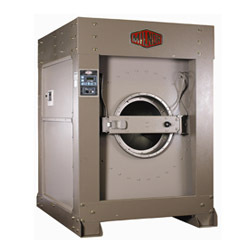 Better extraction saves dryer fuel. 300 G-Force High Extract provides excellent moisture removal. Lower extract speeds can process uniforms, delicate textiles and blended fabrics. E-P Plus Control with vacuum fluorescent display allows operator to choose formulas from real words, not codes. Standard controller features English/Spanish (choice of second language is available). Control also provides diagnostic and error messages. Shortens training time of new employees.